After a week of tension — both in person and online — between protesters and the University, students once again gathered on Towers patio to express their frustration with police and Pitt. This time, Dean Kenyon Bonner — who has written two public letters in response to the violence that erupted during Thursday night’s protest — was in attendance to hear student’s concerns. Bonner released a letter early Monday morning, reiterating the rights students do and do not have as protesters. 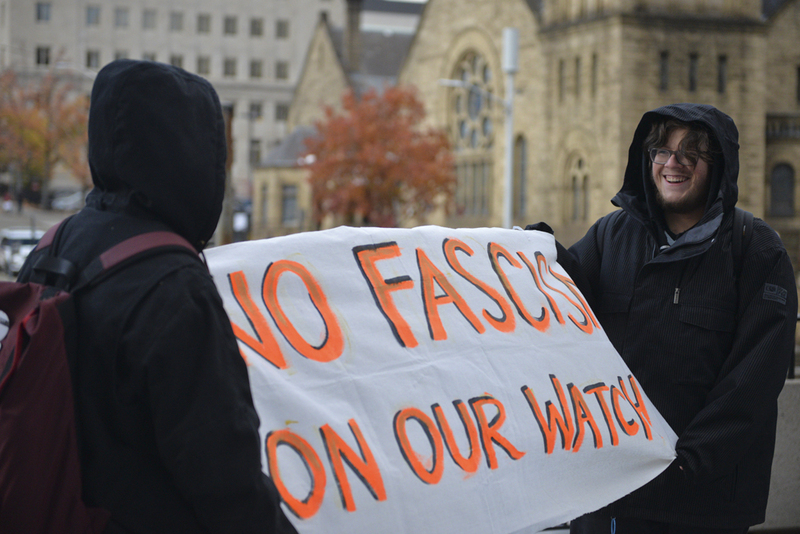 “As a reminder, among the rights Pitt students have under the University of Pittsburgh Student Code of Conduct, is the right to engage in peaceful, orderly and nondestructive picketing, protests and demonstrations to the extent they do not violate public law and do not interfere with the educational process or the rights of other members of the University,” Bonner said in the letter sent out Monday. His doubled-down stance on protesting did nothing to calm students’ complaints that the University has been misrepresenting the events of Thursday night’s protests, when police used force to remove students from Towers lobby. But during Monday’s event, Bonner, University spokesperson Susan Rogers and several other administrators stood watching from inside Towers lobby, which police blocked the students from entering. Bonner said he came to Monday afternoon’s protest to show support for the students and willingness to address their concerns. After students tried to approach him inside Towers but were denied, he came outside to hear them. Bonner said that students can contact him through email or by phone to set up an appointment for further discussions. Although Bonner didn’t say anything to the crowd, for about 15 minutes, the students — from several groups on campus spoke — about their experiences with the police on Thursday and asked Bonner to retract the statement he made Friday, which defended the actions of the officers. Protesters held homemade signs that read “Students will not be silenced,” “If you aren’t angry, you aren’t paying attention” and “Dean Bonner, stop lying.” Five speakers addressed the crowd while reading off of a document composed of several witness and marchers’ testimonial of Thursday night’s event. The document’s writers called Thursday night’s protest non-violent and peaceful but antagonized by police officials. Alex, one of the organizers of the event who asked to not have her full name published, said that she and other students wanted to set the record straight and stick up for their constitutional rights to protest. The police presence Monday unnerved Alex, even though there was no interaction between protesters and police that afternoon. Phil Cancilla, 20, from Banksville, Pennsylvania, was one of two people arrested during Thursday night’s protests. In addition to Cancilla’s own testimonial, the speakers read other statements from individuals who were unable to attend the afternoon’s gathering. “As we were walking, we chanted: ‘No Trump! No KKK! No fascist USA!’ The police officers around me said to me and others, ‘Oh, well Trump is your president now, too bad’ and ‘Trump is president now. What are you going to do about it?’ I tried to ignore it and just kept walking and chanting,” one testimonial read. Although the protesters felt the response from police and university officials are disappointing, they have not deterred the individuals from protesting social injustices.